Typists with a sandwich and a warm coke. The indolent or lucky are going to the cinema. Dressed in the raincoats of a thousand wet nights. Muttering with the lips of the unknown kisses. Grey humps in an empty cinema. You’re dangerous. All wish you were no there, cramping the style. Of paid-for amusement or cynical truancies. You have cut yourself off from barbers and supermarkets. under spit and stubble, as fools or martyrs. You are not new, you have nothing to sell. You are walking evictions. You have no rentbooks. You never answer telephones or give parties. If you have a sense of humour, I want to know. And I can’t stand what you bring out into the open. Comments: Douglas Dunn (1942 – ) is a Scottish poet. 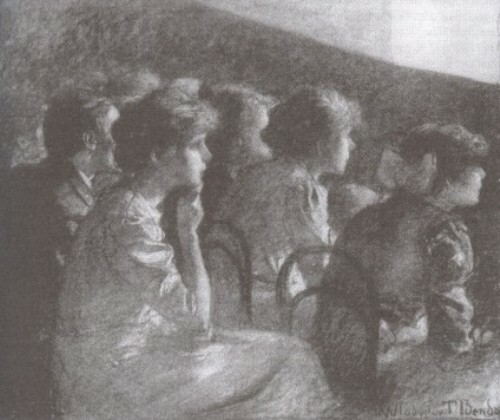 ‘Midweek Matinée’ comes from his second collection, The Happier Life, and presumably describes a Hull cinema, as he was then resident in the town. This entry was posted in 1970s, Poetry, United Kingdom and tagged Cinemas, Douglas Dunn, Hull, Matinees, Sleep. Bookmark the permalink.